This article is dedicated to all of our left handed guitar-playing customers. Although most players – right or left handed – will enjoy the technical information in this article because it applies to other questions that come up regarding the orientation of the pickup in the guitar. Do left handed players need “left handed” guitar pickups for their left handed guitars? Generally speaking, the only time you will need a “left handed” guitar pickup is if you are ordering a pickup with staggered pole pieces. For example, a set of staggered Lollar strat style pickups or a Lollar AlNiCo 3 staggered tele bridge. Because there is 180 degrees difference between a right-handed guitar and a left-handed guitar, the magnet pattern needs to be reversed for left-handed players. But it is ONLY the magnet pattern that is affected by left versus right-handed instruments. If you are ordering a flat pole Lollar pickup, you will not need a “left handed” guitar pickup. This applies to all of our Lollar single coil pickups and Lollar humbucking pickups. The magnet polarity and wind direction of the coil wire are the two variables we want to look at here. These two variables interact to affect phasing and hum-cancelling operations when pickups are combined. The interesting thing is that these two factors do not change when the pickup’s orientation changes. In other words, the pickup can be rotated in the guitar and the polarity and wind direction will stay the same. First let’s start with polarity. As you know, pole piece magnets have one end that has a north polarity and one end that has a south polarity. So regardless of the orientation of the pickup in the guitar, assuming you orient the top of the pickup toward the strings, the same polarity of the magnet will always be facing outward toward the strings. 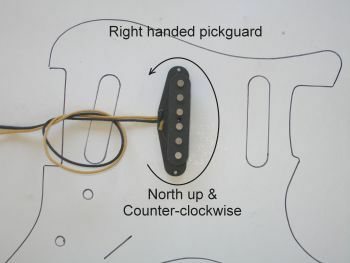 In other words, if the magnet pole pieces are facing “north up” you can orient the pickup anywhere on the guitar, and it will remain “north up.” The pickup’s north poles will be facing toward the strings. Next let’s talk about the wind direction of the coil wire. By this we mean the circular pathway the coil wire takes as it travels from hot to ground. In other words, the pathway the electricity takes as it “flows” from the hot lead, circles around the pickup pole pieces a few thousand times, and then passes to ground. There are only two possibilities for wind direction: clockwise or counter-clockwise. In other words from the hot lead – then around the coil in a clockwise rotation – and then out to ground. Or, from the hot lead – then around the coil in a counter-clockwise rotation – and then out to ground. A simple visual illustration will help you see that polarity and wind direction are not affected when a pickup is put in a right handed or a left handed guitar. This Lollar strat style pickup is north up and has a counter-clockwise wind direction. In this first photo we have the outline of a more familiar right handed strat pickguard, with a Lollar strat style middle pickup. We build all of our strats so that the colored cloth lead (either yellow or white) is hot, and the black is ground. As you can see the coil wire travels from the hot (yellow) lead – around the coil in a counter-clockwise path – and then out to ground. Even though the pickup's orientation has changed for use in a left-handed guitar, its polarity and wind direction are still the same. Now take that same Lollar strat style middle pickup and rotate it for use in a left handed strat pickguard. As you can see, the coil wire STILL travels from the hot (yellow) lead – around the coil in a counter-clockwise path – and then out to ground. Bottom line: It makes no difference if your flat pole pickup is in a left handed guitar or a right handed guitar. Your pickup’s polarity and wind direction will stay the same. 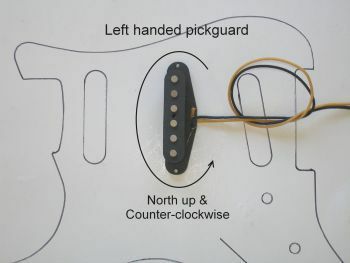 For a related discussion take a look at this blog article, Guitar Pickup Phasing & Lead Wire Direction. Our most popular pickups are flat pole pickups. So leftys that’s good news for you. Give us a call: what you’re looking for is likely in stock and ready to ship.